The JCB LT9 portable lighting towers offer performance and versatility in a compact, transportable package. No two sites are the same, so our premium LT9 portable lighting tower range is designed for total flexibility and ease of use, with unparalleled manoeuvrability offered by the telescopic vertically extending mast. The LT9 and LT9 LED models boast fuel efficiency and easy maintenance too. As you’d expect from JCB, this light tower range is cleverly designed to incorporate all sorts of safety and security features. In short, you can trust this portable lighting to perform for a day, a month or longer. Metal halide model has 4 x 100W bulbs (360,000 lumens). LED model has 6 x 240W bulbs (180,000 lumens). Hydraulic vertical retracting 9m mast can be rotated through 360˚. Low noise levels and 100 litre fuel tank ensures long running time. Trailer mounted for excellent manoeuvrability. Premium componentry including 3-cylinder Yanmar water-cooled engine. With our LED light tower, there’s no warm-up time so you get instant light for fast and easy deployment. The tower is equipped with 6 x 240W LED bulbs, producing 180,000 lumens. LED bulbs use up to 50% less fuel and the tower offers 5kW of auxiliary power, even when the lights are on. Our premium LT9 portable lighting tower range offers total flexibility and ease of use, with unparalleled manoeuvrability offered by the telescopic vertically extending mast. Premium componentry including 3-cylinder Yanmar water-cooled engine provide low noise levels and long running time. As you’d expect from JCB, this range is designed to perform for a day, a month or longer. The LT9 and LT9 LED are quick, easy and safe to service via a large panel door, keeping downtime to a minimum. Canopy panels on these portable lighting towers are easy to remove for maintenance. Site security is paramount, so the isolated control panel is lockable. This means you can leave these light towers in situ for long periods. Our latest digital KS2 control panel is easy to read and more informative than ever, even providing fault readings. Whichever model you choose, you can tailor your lighting tower to any application by using as many or as few of the lamps as you need. You can create the perfect portable lighting arrangement with the LT9 LED range; the mast rotates through 360˚ and each lamp can be individually adjusted for angle and rotation. Stabilisers on these light towers are easy to deploy and adjust. There’s also a spirit level indicator for negotiating rough terrain. The LT9 range is relatively quiet, with noise a level from just 62dB(A), which makes it perfect for many applications. For silent operation, you can connect your portable lighting tower to external power sources via built-in sockets on the outside. You can rotate the LT9 range’s mast through a full 360˚ even when it’s fully deployed for quick, easy refocusing of light. The compact proportions of these portable lighting towers (2330mm x 1273mm x 2280mm) mean you can transport up to nine at once on a 40ft container. This compactness also means your tower will fit into small areas on site. The LT9 lighting towers are relatively light (1100kg with fuel, 911kg without), so you can move them onsite and between sites easily. To make for an even more compact portable lighting source, the mast extends/retracts telescopically and vertically. The mast also locks down in transit so your machine can’t move around. With standard-fit road lights, it’s easy to transport your LT9 or LT9 LED light tower between sites. Ultimate portability is guaranteed on these lighting towers because they’re mounted onto an EU-compliant trailer. There’s also a tow bar for shifting them around site, as well as forklift pockets and a single-point lift for loading onto other larger trailers. These premium portable lighting towers produce 6.4kW (230V) of light at 50Hz to meet the demanding requirements of any site. 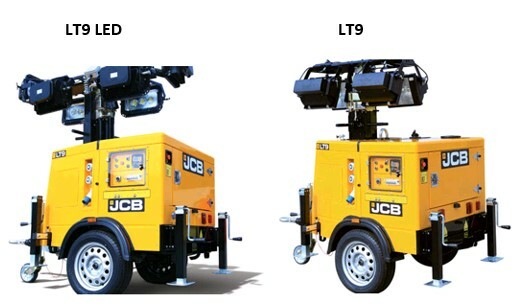 The JCB LT9 has four powerful 1000W metal halide lamps, while the LT9 LED is equipped with six 240W LED units. With our LED lighting tower, there’s no warm-up time so you get instant light for fast and easy deployment. Metal halide lamps provide near-daylight brightness; our LT9 LED, meanwhile, use up to 50% less fuel. The telescopic mast of these portable lighting towers deploys automatically using hydraulics in just 13 seconds. Time is money, so the LT9 range of lighting towers is designed to provide up to 95 hours of run time between fills, courtesy of a large fuel tank.